China's Finest. Go Pro clone tested. K100-forum.com » Parts, Accessories and part substitution » Product reports » China's Finest. Go Pro clone tested. I had a Go Pro Hero 3+ last year but decided that I couldn't justify the expense as I wasn't getting the use from it. Sold it on eBay for £20 less than I paid, so wasn't too bad. Took another notion this year and found this. £70 from a UK eBay seller and includes a spare battery. Bought a waterproof case for £10 and any of the Go Pro mounts fit. 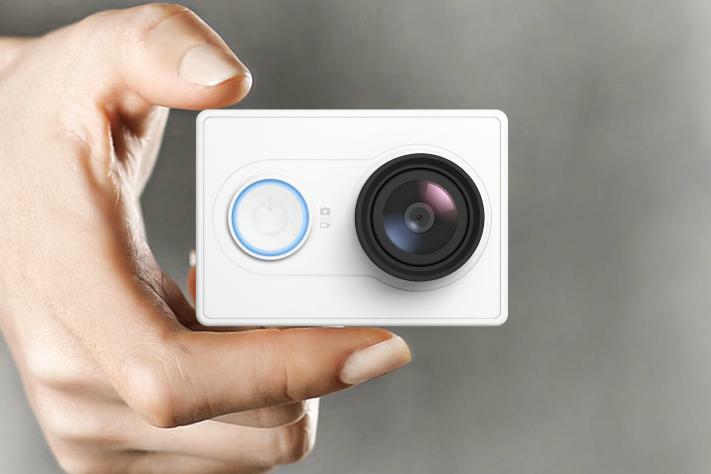 It uses the same lens and chipset as the Go Pro and a Sony sensor. Runs at up to 16mp. Only a couple of mm different in size. Check this video that I took last Tuesday in Donegal along the WAW. I think its better than the Hero 3+ that I had last year. Going to play about with it some more, but I think its a bargain if you want to try some action video. Bit overcast at first, hey, its Donegal, but brightens up later in the clip. So, umm, what's it called? GoPro just released the new Hero4 Session. Thanks Keith. Yes it's the Xiaomi Yi. One thing I've noticed and it may be just me, but I think the quality of the video is reduced using the little app on the forum. I feel that the quality improves by using a direct link to YouTube. Youtube detects your internet connection speed and sets the quality accordingly by default, usually around only 360p (we have slow speeds here in Oz). Ultimately, quality will be determined by what resolution it was shot in in the first palce but higher resolutions will 'chug'. If you click the Youtube link and watch on the Youtube site you get the quality setting (gear) icon bottom/right where you can change the resolution to HD. John, just out of interest do you know what resolution, bitrate and frame rate you used to record that? I do quite a few track days and wanted front & rear views so I've just bought one of these. I also have a Garmin Virb Elite which I have to say is a better but it was waaay more expensive. Don't know how they make the stuff that cheap. Looked at that one, Mike, but fancied the 'expensive' one as it seemed to slightly better specced and some reviewers seemed to lean more towards it. Not too much money if it goes walkabout down the track or road. Keith, shot that at 1920x1080 25p 16:9. Supposed to be 16mp. Realised earlier today that I can set it to 50p and tried it on the bike for 20 minutes. Pin sharp and very smooth on normal roads especially. I'm trying my hand at a bit of video editing using iMovies. Relatively easy to use, it's the lack of talent from the operator is the problem. Realised that you can over edit. Because those roads in Donegal were so bumpy, I used stability control and a shutter fix. Results were awful but reset with the click of a button. Can change the contrast and exposure settings for different sections, too. Bit like photoshop for video. Again, easily overdone. I'm just uploading the second video to Vimeo as I believe the results may be better than You Tube. I'll post the link when it's finished and you can take a look and see what you think. Uploaded part 2 on Vimeo. Still a bit bumpy but can't be helped. Some of those roads are rough. Looks good John. Much better quality. Did you use a higher frame rate? No, same settings as the first. Finding that when I'm going through trees with a bright sky, it's darker where I am. Something to do with white balance? Have it set for auto on that. May try the other setting. I think 30fps would make it smoother without blowing out the file size too much and if you can change the bitrate, that should be about 12kbps or more. White balance will work better on auto. I noticed you had quite a bit of sky in the frame in the last video (Glengesh Pass) which would bias your auto exposure to the dark side. Besides I think it would be great to see more of the instruments and handlebars for interest and a bit of perspective. Great scenery. Nice ride. Thanks for posting. Right. Did another short video while out on Sunday at the highest setting and have uploaded a five minute clip just to get an idea of the playback quality. Been experimenting with different mounts. Tries it on one of the engine bars but too much vibration coming through even just revving the engine on the centre stand. There are some weird and wonderful mounts out there but I'm too mean to pay what some are charging for them. Heres the link for the test clip. I'm quite pleased with the result for a £70 video camera. That's pretty good quality and smooth. Have you tried the camera mounted on the bike yet? I'd be interested to see how it performs onto a solid base. My £38 job is rubbish-you get what you pay for-I know!! Was trying that at the weekend on a run up the Antrim coast road. It's a hoot when there's not much traffic! I used one of the sticky pads to attach it to the lower edge of the screen between two mounting bolts. When it worked, it was great. Good position and it picked up the exhaust note really well. But. The GS is a lumpy old twin, some call it character, and when opening the throttle the camera was trying to do somersaults. Glad I didn't pay £75 for the Wunderlich one for the same place! Using the gears more and keeping the throttle light helped but for me, it's back to the helmet mount. Last year I had a K1600GT and stuck a sucker mount on the side of the fairing and got great results, but it was a six cylinder. Miss it sometimes but was a bit big for me. Unless you have a really smooth road or very compliant suspension, a helmet mount is going to work best. But I think any four cylinder bike such as a K shouldn't present too many problems mounted on the nose of the bike. I've uploaded a short clip from Saturday. Watch out for the lunatic Poles near the end of the clip at the temporary traffic lights. If you can make it out, that's Scotland across the water to your right. Had a bit of an issue with condensation towards the end of the run. There was a little rain and I think some must have got into the 'waterproof' shell. As it warmed up further up the coast the image became blurry. No blame on the camera. The shell was just from eBay. I think Xiaomi now do there own case so may look into that. I've had my camera on the front of my Brick and the results were poor. If you look at my JJ Cobas thread,you'll see that it's very unstable imaging. I suspect that the material used in the bracket and case could be the problem. The Garmin Virb I have is so much better but it's elongated shape adds length to the support needed so I've experienced instability there too. I might try a Nilox if I can raise enough funds through clearing out the spare parts I've accumulated and will probably never need. Back to the cheap camera I have,apart from the poor imaging,it's recorded some clips that will not play back. It seems to record 4or 5 clips then corrupts everything else. I've lost some great footage around Spa,Cadwell and Hartside pass because of this so it looks like the bin for the camera!